"Your Royal Highness, would you do us the great honour of naming my ship?" 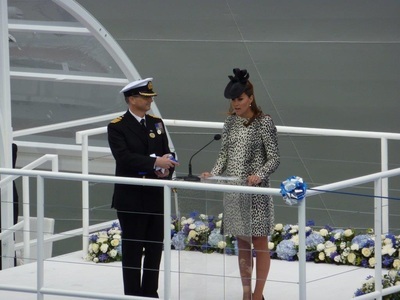 Captain Tony Draper smilingly asked Her Royal Highness the Duchess of Cambridge. Then came the moment everyone had been waiting for. 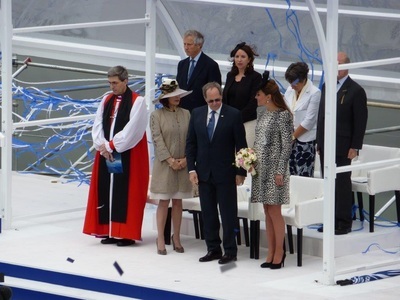 The Duchess cut a ribbon to release a £1250 Nebuchadnezzar of champagne against the hull to christen Royal Princess. Not that it was the first Nebuchadnezzar to be broken that morning, it was in fact the third. The first two were trial runs, making the bubbly bill reach an eyewatering total of nearly £4000. The bottle smashed first time and a resounding cheer - and sigh of relief - went up from the assembled crowd, an assortment of media plus a celebrity contingent. Princess Cruise Line's latest ship certainly has some style. 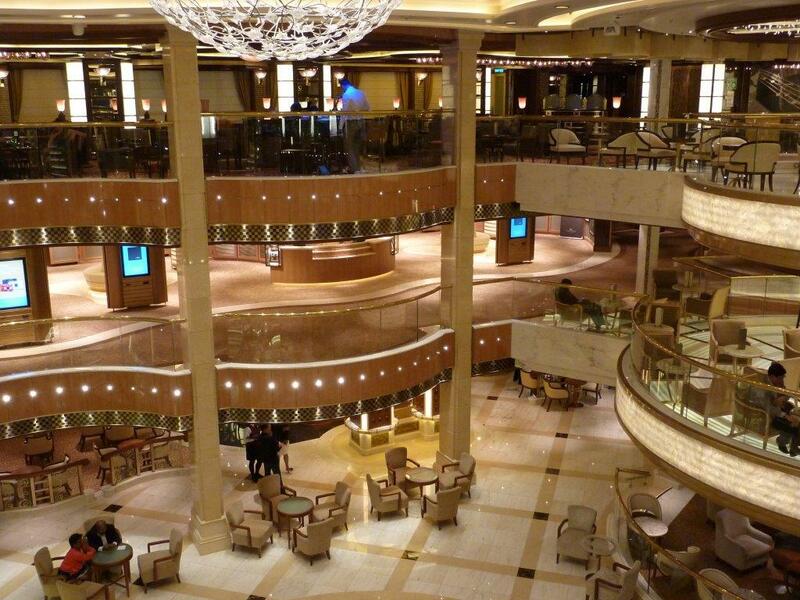 The three-deck Atrium is the social centre of the ship, offering drinks, snacks, meals, entertainment and shopping. Venues include a galateria service sundaes, smoothies and Italian crepes, an Ocean Terrace seafood bar and Bellini's cocktail bar, an ideal place to watch performances in the Piazza. The International Cafe serves pastries, paninis and salads while at Vines wine bar passengers have a choice of over thirty different wines with free tapas as accompaniment. The area abounds with marble - the ship has twenty tonnes of it, apparently more than thirty times the amount used by Michaelangelo to construct David. 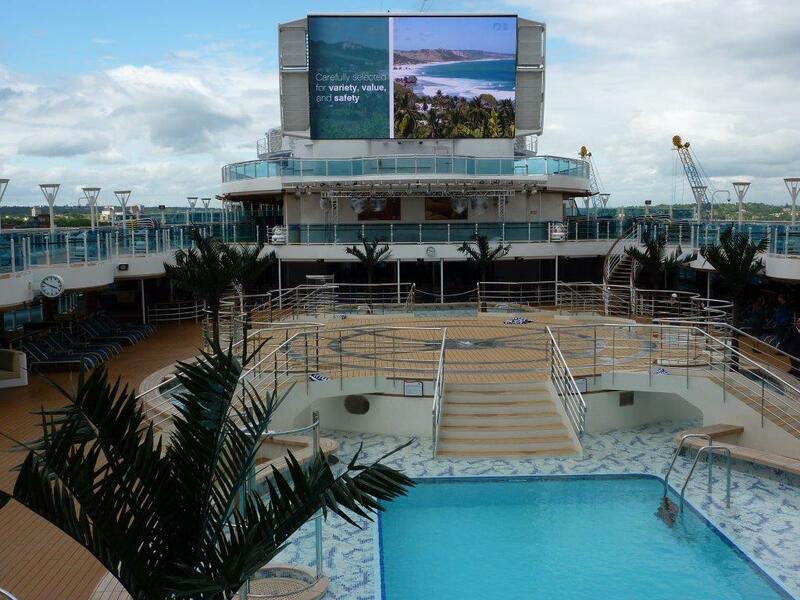 The ship boasts the largest outdoor movie screen at sea. ‘Movies Under the Stars’ is a great idea where passengers on loungers can watch films while munching on complimentary pizza or popcorn. What’s more, the experience is not just limited to warm weather, as cosy fleece blankets are provided to keep you snug should the temperature drop. The giant screen sits high above Fountains Pool tropical island which cleverly transforms into a dance club at night, complete with a sound and light show where 85 water jets shoot streams of water 33 feet into the sky. 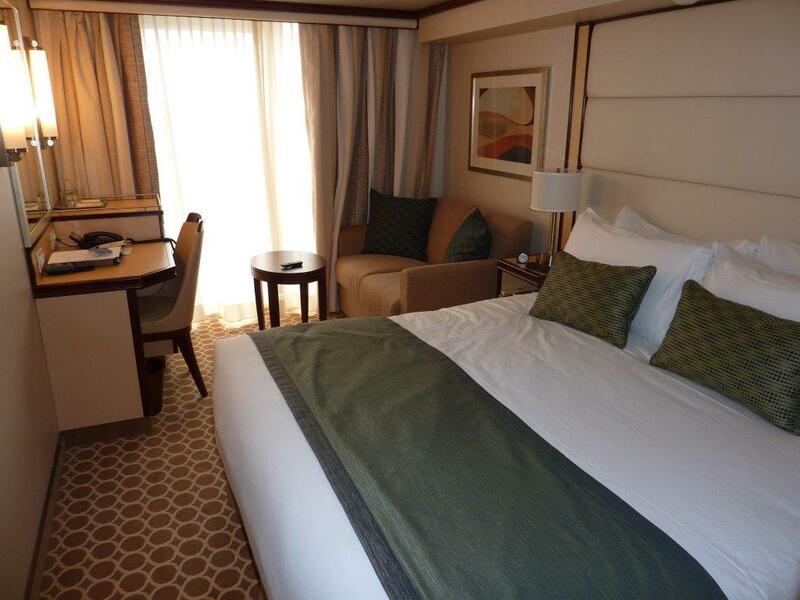 Updated features in Royal Princess’ staterooms mean larger showers, hand held showerheads, mirrors with built-in vanity lighting, pillow top mattresses and bigger, wall mounted televisions. Decorative wall sconces provide enhanced lighting and contemporary finishes place the accent on soft, soothing colours and 80% of the ship’s outside cabins, have balconies. The most exciting design element on board is an over-water SeaWalk, a cantilevered, glass-bottomed walkway on the top deck, 128 feet above the waves, extending over 28 feet beyond the edge of the vessel. Perhaps best enjoyed by those with a head for heights. As you may imagine, the views from here are dramatic. 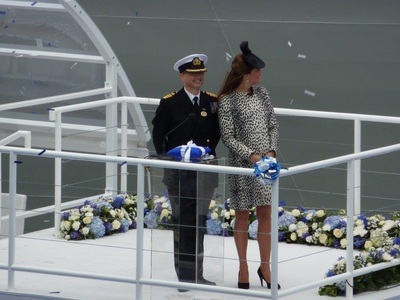 The ship has many other top-class attractions and will no doubt delight many thousands of passengers following in HRH's footsteps.